Testifying can be terrifying when everything hangs in the balance and so much depends on your words. If you're litigating custody of your children as part of your divorce, however, you'll have to take the witness stand. 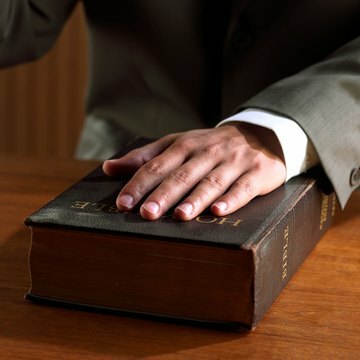 Sometimes, if you don't have a lawyer, the judge might let you speak from your seat, but you must still do so under oath and your spouse's attorney can still ask you questions. The good news is that while you have to answer under most circumstances, you don't have to do so quickly or immediately. You can take a moment first to think about what you’re about to say. You're probably not going to take the witness stand with the intention of lying, but it can be surprisingly easy to unwittingly express falsehoods. For example, if your spouse's lawyer asks if you ever left your young child unattended and you reply, "No, never," you've probably told an untruth. Worse, the judge knows it – it's unlikely that you never left your child in the living room alone and walked to the kitchen to retrieve something you forgot there. It's better to say that you can't remember any specific times or incidents than to make a statement that's obviously untrue. In a divorce trial, a judge is usually your entire jury, so you don't want to give him reason to doubt your credibility. If you tell an obvious untruth over something little, he might wonder if you'll tell a whale of a lie over something important. Your spouse's attorney is permitted to ask you questions differently than your own lawyer. Court rules allow him to lead you, which means he can try to get you to answer in a certain way that benefits his case. He may also try to provoke you in order to portray you in an unfavorable light. Don't let him get to you or strike a nerve. Just as you pause after each question to consider your answer, you can do so to calm yourself and keep the anger out of your tone. How you say something can be as important as what you say. This is about custody of your child, so you don't want to make the judge wonder if you fly off the handle too easily or have anger management issues. Everyone knows you probably no longer love your spouse or you wouldn't be in divorce court. However, it won't do you or your case any good to vent about it from the witness stand. Avoid calling him names or making flagrantly disparaging comments about his character – even if they're true. The court's custody decision is based on what the judge feels is in the best interests of your child. The judge will weigh a list of several factors to determine which of you meets this criteria most closely and which of you is the more suitable custodial parent. In many states, one such factor is which of you is most likely to facilitate an ongoing and healthy relationship between your child and the other parent; the court wants both of you to take an active role in your child's life. You can demonstrate that you're that parent by not saying anything in the courtroom that expresses open hostility or animosity toward your spouse. Make sure you really understand your spouse's lawyer's questions before answering. It won't benefit you to offer information the attorney wasn't looking for because you misconstrued his intent. Even if you do understand the question, don't embellish your answer or give more than is necessary. You'll have your chance to present the information you think is important through direct testimony, either on your own if you don't have an attorney or when your attorney questions you. Don't try to squeeze extra information in when your adversary is cross-examining you.